This security poster illustrates Russian Anti-Personnel Mine & Anti-Lift Fuzes. This security poster features thirteen different full size fuzes with descriptions, mechanical timer fuze and electronically fired mine initiator, and all fuzes will fit any former Warsaw Pact anti-personnel mine, anti-tank anti-lift fuze well, and demolition block with internal M10 x 1 thread. This security poster also shows information about the family of Russian series of mine and booby trap fuzes. Thirteen different full size fuzes with descriptions. Information about the family of Russian series of mine and booby trap fuzes. Mechanical timer fuze and electronically fired mine initiator. All fuzes will fit any former Warsaw Pact anti-personnel mine, anti-tank anti-lift fuze well, and demolition block with internal M10 x 1 thread. 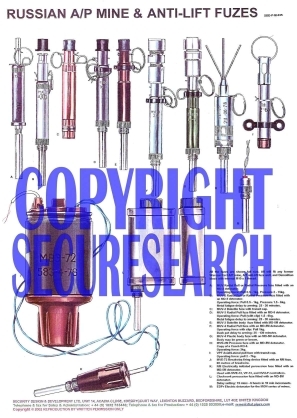 This security poster features thirteen different full size fuzes with descriptions, mechanical timer fuze and electronically fired mine initiator, and information about the family of Russian series of mine and booby trap fuzes.